Alpro has released a new commercial, inviting you to shake up breakfast with Alpro. The 20-second spot released by the brand of soy based food and drink products shows you how to change a little and enjoy a lot your breakfast every morning, by featuring Soya Original drink, which is delicious ice cold, Alpro plain yoghurt with coconut, which can be combined with granola, and the Roasted Almond Unsweetened drink, which can be combined with cereal. 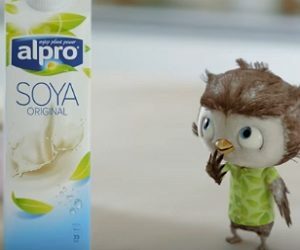 Besides these products, the ad features also an animated little bird chirping near the glass of Soya drink, an animated little monkey holding forest fruit to be put in the bowl of Alpro yoghurt, and an animated squirrel pushing the bowl of cereals towards the box of Almond milk. The ad ends with the brand’s tagline, “Breakfast with Alpro”.